The recruitment process for our new President and Vice-Chancellor is now complete. Professor Mark E. Smith will join us in October 2019, in time for the new academic year. He is a distinguished physicist and an international research leader in the field of solid state nuclear magnetic resonance. Mark will be joining us from the University of Lancaster where his tenure as Vice-Chancellor shows a strong record of success. Our interim President and Vice-Chancellor, Professor Mark Spearing, will continue to lead the University until October. This page details the recruitment timeline, so you can see the process we followed in the search to find our new Vice-Chancellor. 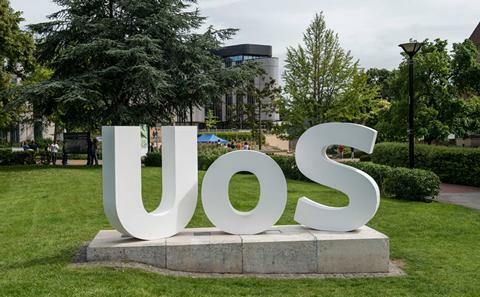 Staff and students also received updates from the Academic Lead for the recruitment process, Professor Mandy Fader, on SUSSED and a dedicated Searching for our next Vice-Chancellor intranet site. The extensive input from our staff, students and other stakeholders enabled us to develop a strong set of attributes that we looked for during the search for our new Vice-Chancellor. Download the Vice-Chancellor Recruitment Pack to learn more. Download the Vice-Chancellor Recruitment Pack to learn more. In October 2018 we received 744 responses to the online survey in which staff and students provided their feedback on what they consider to be the challenges that a Vice-Chancellor must be able to deal with and the attributes that person should have. To give staff and students additional opportunities to provide feedback seven, open, drop-in sessions were held between 29 October and 7 November. Alex Acland (lead consultant for our search partner, Odgers Berndtson), held drop-in sessions on Highfield Campus over two days, while Professor Mandy Fader held a further five sessions on our campuses at the National Oceanographic Centre Southampton, Winchester School of Art, Avenue and University Hospital Southampton. There were no presentations during these sessions; they were simply another chance for staff and students to provide their input. For those unable to make the drop-in sessions we created a dedicated email inbox. To enable our alumni to provide their input we promoted this to them through the Southampton Connects Alumni magazine. Students were also provided with opportunities to provide informal input via a physical message board promoted by the Students’ Union in a number of venues. Our search partners held meetings and listened to feedback from a range of stakeholders including: the three recognised trade unions; the Vice-Presidents; the faculty Deans; Southampton City Council leadership; SUSU sabbatical officers; the Professional Services Leadership Team and colleagues at the Malaysian campus. The three Senate representatives on the Selection Committee also ran informal engagement so that Senators could provide individual input into the consultation. Targeted global search by Odgers Berndtson created a candidate long list. The Selection Committee decided upon a short list of candidates. Formal interviews and assessment took place. We announced on 8 April 2019 that Professor Mark E. Smith will be joining us from the University of Lancaster. Further details, including his remuneration, are available on our News page. Professor Mark E. Smith will join the University as President and Vice-Chancellor in time for the new academic year.